Luckily my friend Amelia was using her noggin last month, when the first quinces were ripe. She peeled, cored, and sliced the little buggers and roasted them with vanilla, cardamom, wine, and honey after a recipe I adapted (and posted here) from Deborah Madison’s Seasonal Fruit Desserts a couple of years ago. In order to be edible, quince need to have the crap cooked out of them but when they do, they turn pink and taste like magic and fairytales perfumed with roses and tropical fruit. We ate a bunch slathered on crackers with Cowgirl Creamery’s Mount Tam cheese, and she kindly left me to my own devices with the rest of the jar. In San Francisco, we don’t have trees that turn color, or frost that coats the ground. The way I know that Fall is here is that I no longer crave nectarines or zucchini, even though they look as colorful and shiny as ever. Instead I start dreaming of baked apples, crispy potatoes, and butternut squash soup. I drained the quinces, reserving their syrup, and pureed the fruit to a thick paste with a touch of lemon and honey. 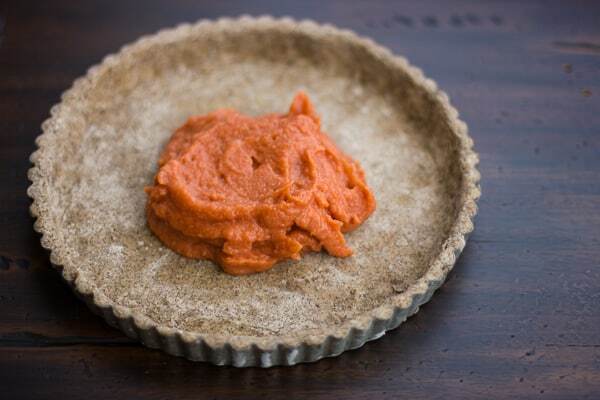 I spread this into an unbaked tart shell, a twist on my gluten-free pie dough made with buckwheat flour, whose nutty-spicy taste I especially love with fall fruit. Over the quince puree went a few apples, peeled, cut off the core, and sliced fairly thin. I found a new to me variety called Belle de Boskoop at Everett Family Farm (my favorite place in the world) which hail from the Netherlands but are billed as a French culinary apple. These are crisp and tart-sweet, with a floral perfume and firm flesh that makes them ideal for baking. Not wanting to let the rosy quince cooking liquid go to waste, I reduced it down to a thick syrup that, due to quince’s high pectin content, turns a jelly-like consistency when cool. I used this to glaze the baked tart. Baked apples can look anemic and dry, so tarts like these need a glaze to give them some shine and color. 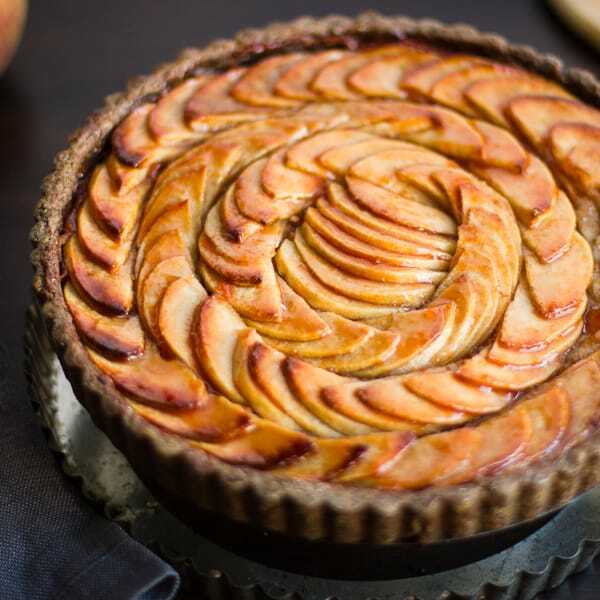 Normally I would have parbaked a tart crust like this, but since the filling is relatively dry and the apples like a long bake, it isn’t necessary here. 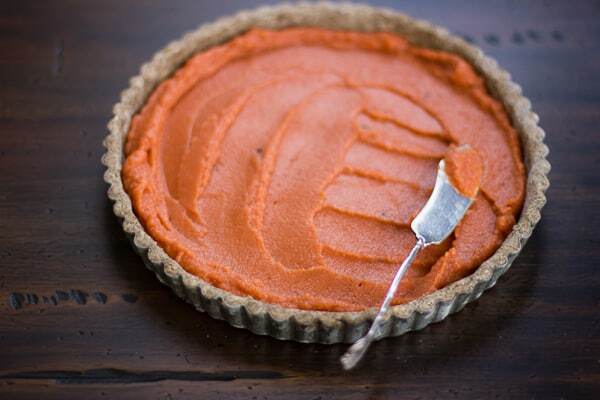 The sturdy crust stands up well to the filling, staying crisp for days afterward. 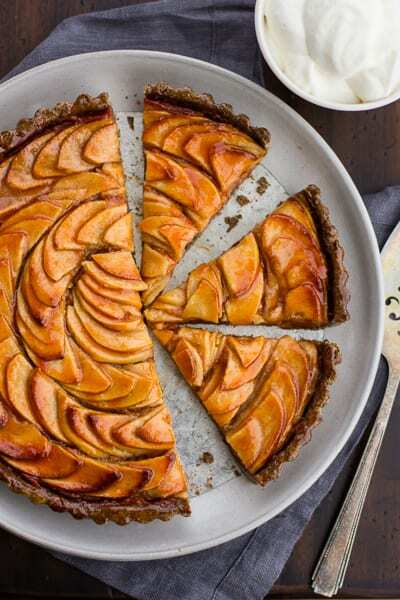 The finished tart has a sophisticated, barely-sweet flavor thanks to the cardamom-kissed quince, tart apples and whole grain flour. The charcoal-hued crust bakes up crisp with the rich flavor of buckwheat that I find completely addictive. These bold tastes are tempered by tender apples, which caramelize a bit around the tips. 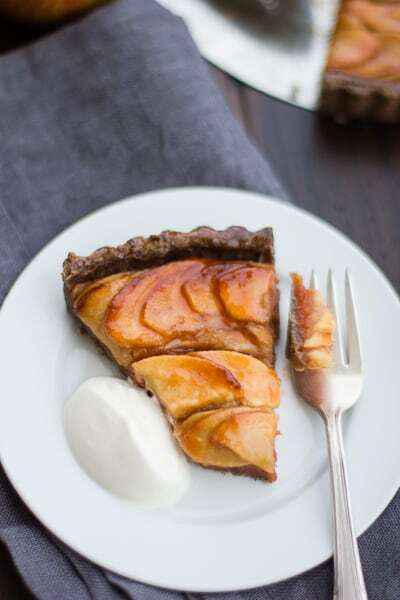 A dollop of sweetened whipped cream helps to further smooth away any rough edges, though vanilla ice cream would be nice with warm tart, too. This recipe has a few different steps: roasting the quince, pureeing them to a paste and reducing their syrup, making the dough, and assembling the tart. 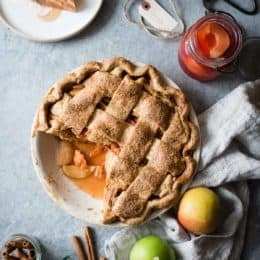 However, the quince can be made up to a month ahead and stored in the refrigerator in their syrup; the pie dough can be made one or two days ahead; and the finished tart keeps well for at least a day or two. This will make enough quince for 3 tarts; they are also delicious eaten on their own with cheese and crackers, or chopped and baked into muffins or pancakes. As for the crust, be sure to use sweet white rice flour (such as Mochiko brand), which is naturally stickier than regular rice flour. I like using the fraisage method (in which portions of crumbly dough are scraped across the counter under your palm) to bring the dough together, but if that freaks you out, you can just give the dough a quick knead in the bowl until it sticks together in a ball. This dough is a bit more delicate to roll out than a wheat-based pie dough, so be gentle with it, use plenty of flour, and keep a metal bench scraper or spatula nearby to help you turn and flip the dough as you roll it out. I like to get it started by using a pressing motion with the rolling pin. If it cracks or tears, smush it back together with your hands, or use dough scraps to repair tears in the final dough. See my original post on gluten-free pie dough for photos of the fraisage process.All ounce measurements here are by weight. In a large saucepan, combine the water, sugar, honey, vanilla pod and scrapings, and cardamom. Bring the mixture to a boil, stirring occasionally, then simmer over low heat while you prepare the quince. Peel the quince (I like to use a T-shaped vegetable peeler), and cut them off the core (or halve and core for cleaner slices). Cut the quince into 3/4″ thick slices. Lay the quince slices in a gratin dish or other shallow baking dish with a 2-quart capacity. Pour the boiling syrup and spices over the quince. Bake the quince, uncovered, for about 2 hours, turning the slices over in their juices every 30 minutes (and more frequently during the end of the cooking time). When done, the quince should be tender and rosy, and somewhat translucent. Remove the quince from the oven and pour the wine over them. Cool the quince in the their juices, pack into a quart-sized mason jar, cover with the liquid, and refrigerate for up to 2 months (or store in the freezer for longer). Make your ice water by filling a small cup with ice and topping it with cool water. Set aside while you get on with the recipe. 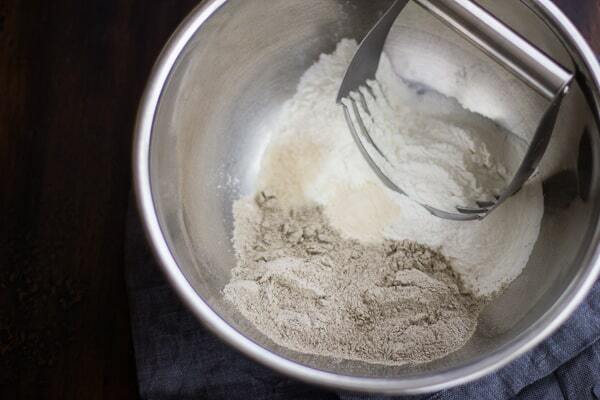 In a large bowl, combine the flours, cornstarch, sugar, xanthan gum, and salt, and stir to combine. Scatter the butter slices over the top, and work with a pastry blender until the butter is in almond-sized chunks. Tablespoon by tablespoon, dribble in the ice water, tossing with a rubber spatula and/or your hands after each spoonful, until the dough is just damp enough to hold together when you give it a squeeze. Add drops of water directly to the floury bits if needed; you may need more water, or less, depending on how warm and worked-in your butter is. When finished, the dough should look like a pile of fat crumbles. We’ll bring it together in the next step. 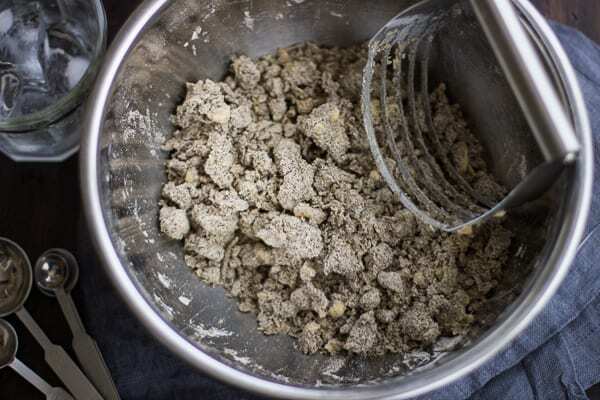 Dump the dough out onto the counter, and quickly fraisage it by scraping an eighth of the dough at a time across the counter beneath your palm. Scrape it up with a metal bench scraper, and gather it into a ball. Place on a piece of plastic wrap, flatten into a 6″ diameter disc, wrap, and chill for at least 30 minutes or up to 2 days. When you’re ready to use the dough, let it soften at room temperature for 5-10 minutes. The dough is a touch more delicate than regular pie dough, so it benefits from slightly softer butter. Gently roll it out into an 11-12″ round on a surface dusted lightly with buckwheat flour. Dust the pin, your hands, the dough, and the work surface with just enough flour to keep the dough from sticking. 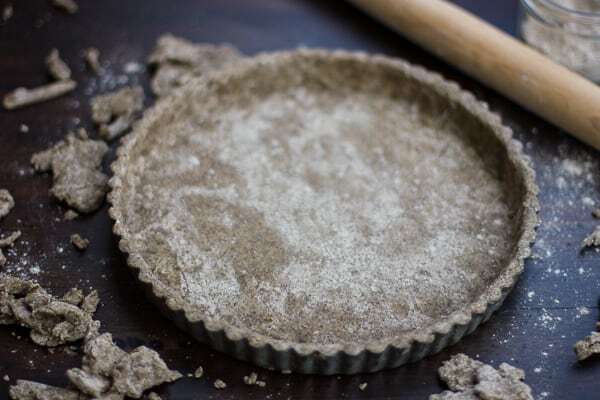 If the dough tears, pinch it back together, or use a scrap of dough to patch it up.Gently lift the dough into a 9 or 10″ tart pan with a removable bottom; the dough may crack and tear, and that’s ok, just press it into place with your fingers. Trim the edges to 1″ and fold them over to make a double-thick crust, trimming the top of the crust flush with the pan. Freeze the crust until firm, 15-20 minutes (or wrap and freeze for up to a month). Position a rack in the lower third of the oven and preheat to 425ºF. 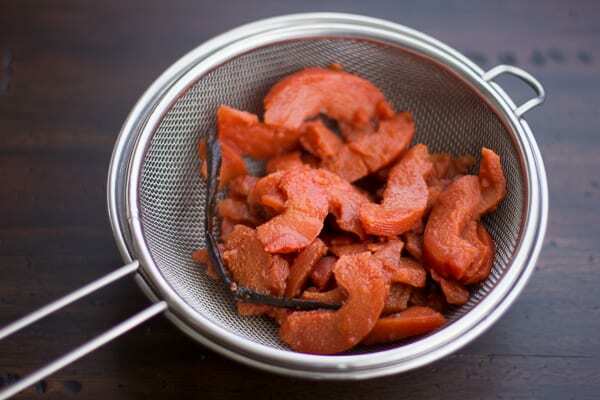 In the bowl of a food processor, combine 1 1/4 cups of the roasted, cooled quinces with the lemon juice and honey. 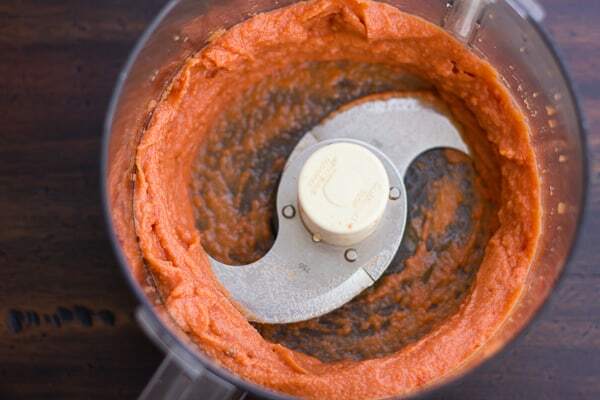 Puree to a smooth paste, adding a tablespoon of quince syrup if needed to help the mixture turn over. Spread the paste evenly in the bottom of the frozen, unbaked tart shell and set aside. Place 3/4 cup of the quince syrup in a small saucepan. Simmer over medium heat, swirling occasionally, until reduced to 1/4 cup, about 10 minutes. Set aside. Peel the apples, cut them off the core, and slice them about 1/8″ thick, keeping the slices together for easy fanning. (If the apples start to oxidize or turn brown, drop them into a bowl of cool water and the juice of 1 lemon as you work – some apples oxidize more than others.) 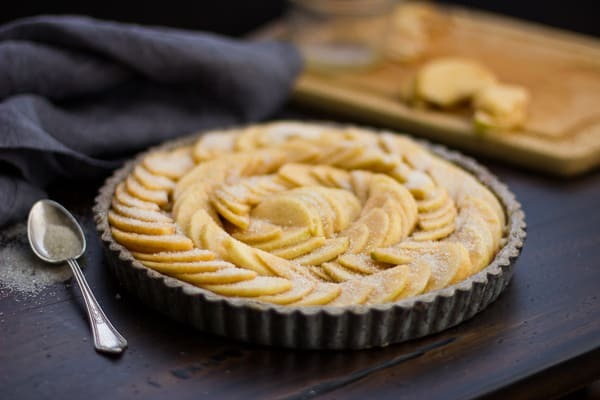 Fan the apple slices out the long way with your fingers and place them in concentric circles in the pan with the round edges facing out. It works well to use the fatter slices in the outermost rings. You may or may not need all the apple slices, but you can pack them in pretty tightly; they’ll lose a lot of volume as they bake. Brush the apples with the melted butter and sprinkle with 1-2 tablespoons of sugar (depending on the tartness of the apples). 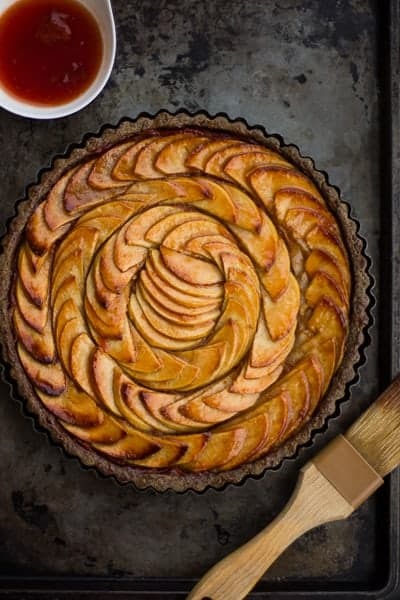 Bake the tart at 425º for 20 minutes. 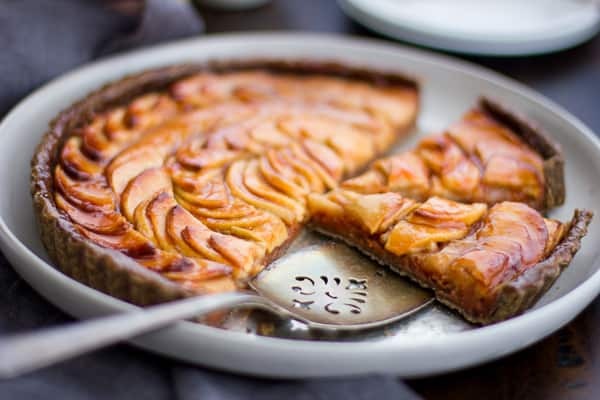 Remove the tart from the oven and brush with a layer of the quince glaze, reserving the rest. Reduce the heat to 375º and bake until the apples are tender when pierced with a knife and golden around the edges, about 40 minutes longer. 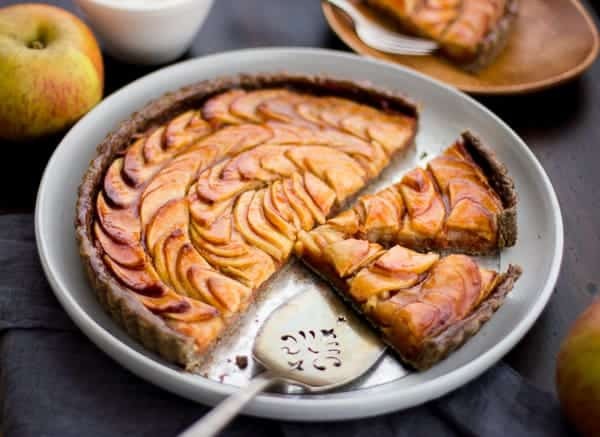 Let the tart cool slightly, then brush the apples and the top of the crust with the remaining quince glaze (re-warm until fluid, adding a few drops of water if necessary to loosen it up). Remove the sides of the pan by placing the tart on a large can or ramekin and easing off the sides. Slide the tart onto a cutting board and use a large, sharp chef’s knife to cut it into wedges. 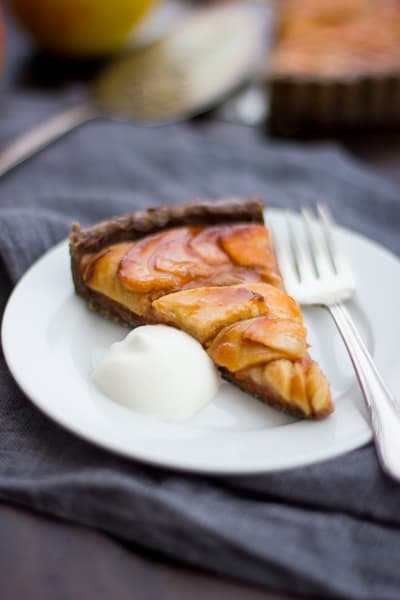 Serve the tart warm or at room temperature with lightly sweetened whipped cream or ice cream. Leftovers keep well, refrigerated and airtight, for up to 4 days. What a pretty tart. I imagine this smells good straight out of the oven. Thanks for sharing this lovely recipe. Stunning. Quincessential, I mean : ) Never tried quince…perhaps this will change that. Haha, thanks! Quinces have such amazing flavor, I think it a real shame that they're not more widely used these days. If you want to taste quince without the fuss, though, you can sometimes find membrillo (Spanish-style quince paste designed to be eaten with manchego cheese) at fancy stores such as Whole Foods. This tart is perfection. Haven't had quince in a long time, you've inspired me. Alanna, this is absolutely stunning. I love love love those glazed apple rings – beautiful! 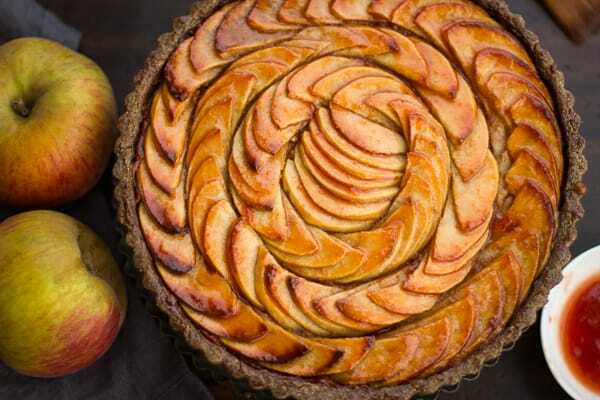 I've made quite a few apple tarts but none as beautiful and unique as this. I can't get over how lovely it looks and sounds. Thank you for sharing it with us Alanna! Awwwww!! Thanks, Monet. You're too kind. This look absolutely divine. I love the idea of quince paste under the apples. This is so incredibly beautiful, I am literally in awe of your photographs. I can't believe this is healthy and so nutritious. Great job!! Wow those golden tops are just gorgeous. I've never cooked with quince before but a quince tart sure does sound tasty! 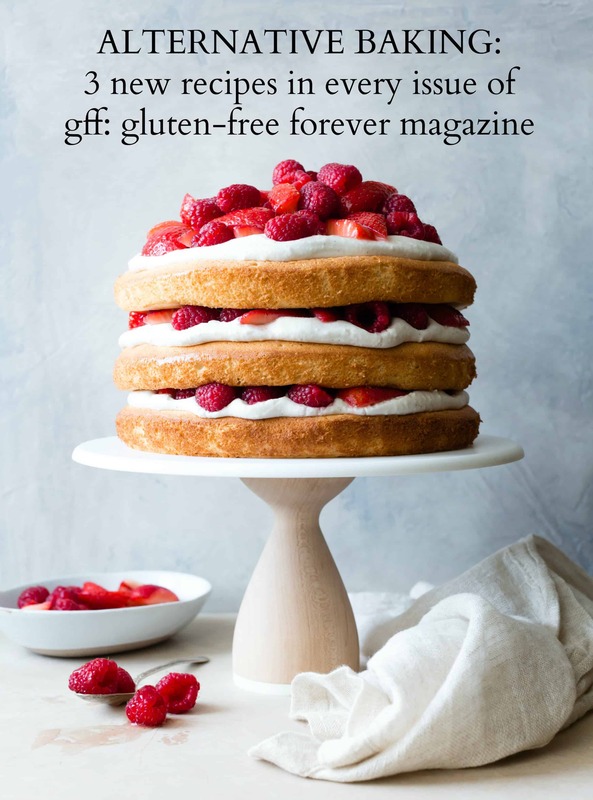 And I always have the utmost respect for those who can bake gluten free. Amazing! Hi, Liz! 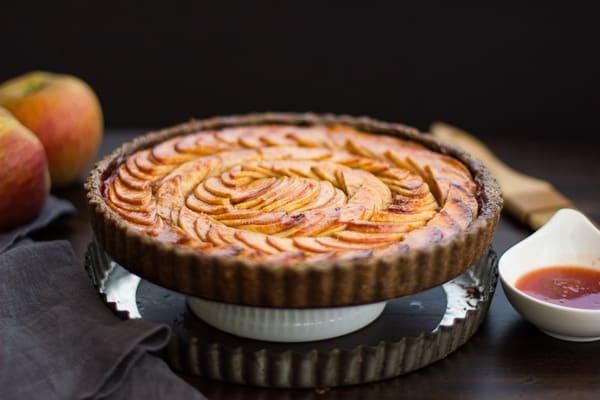 Thank you for trying out the tart, and for the very kind comment – I'm so glad you liked it! I love working with quince, too – they're so very magical and other-worldly tasting. 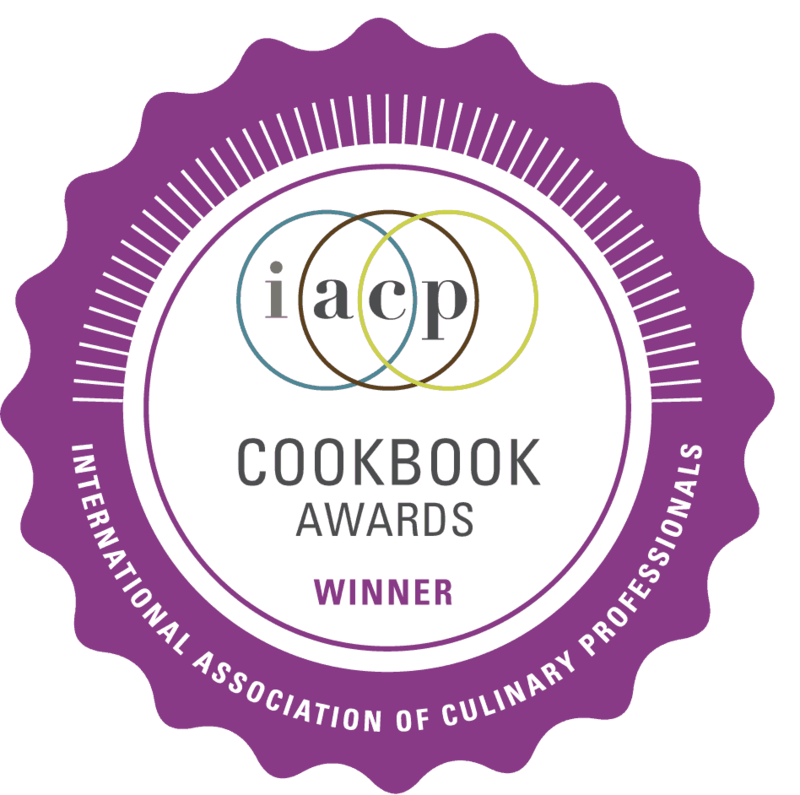 Thank you so much for reading, and for trying out my recipes – that means so much to me! 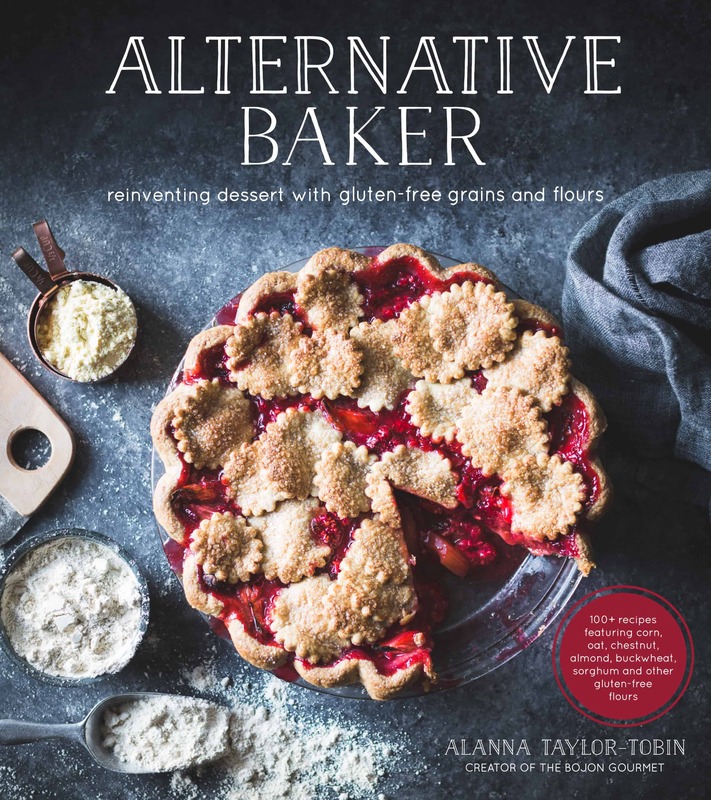 I'm new to your blog, having just clicked through a post by David Lebovitz… I would love to leave out the xanthan gum in the crust. Can I get away with this? Hi Kathy! I would say go for it. The dough is rather brittle, but if you're forming it in a pan (as shown here), I don't think the lack of xanthan gum will make a huge difference – you'll be pressing cracked dough into the pan anyway. That being said, I haven't actually tried this without it, so it could alter the texture of the finished product. Thanks for clicking through, and please let me know how it goes! Leaving out the xanthan gum worked just fine. I did add a teaspoon of ground flax seed, which may not have made any difference. And, I needed this one to be dairy free so used coconut oil and coconut butter (2/3 and 1/3). Normally I would use just the coconut oil but ran out. With the coconut solids from the butter, the crust baked a bit browner, so watch out. Then I simply pressed the cold dough into the tart pan with my hands rather than rolling it out. It wasn't a tender crust, but worked in a pinch. There is nothing like a flakey, buttery wheat crust. Beautiful. I'm especially entranced by the buckwheat crust. I love buckwheat! I'll have to play around with it for a gluten-free crust. Thanks for the idea! Thanks, Elise! I'm a bit of a buckwheat freak. :) Let me know how it goes! Wow. This looks simply amazing. I've just discovered quince (I've never lived in an area where they were available until this year), and am totally in love. 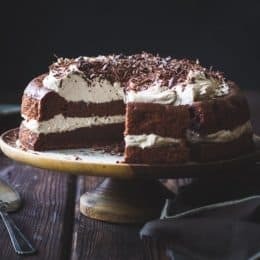 Thanks for this gorgeous and undoubtedly tasty dessert recipe! Thank you, Meg! Quince are so very loveable – I'm glad you're getting to discover them! Okay, I admit after seeing this gorgeous tart (and after having made your delicious lentil soup with chestnuts and fennel last week), I sought out some quince. They are sitting next to me on my desk, perfuming the air with the most lovely scent! Can't wait to make this. 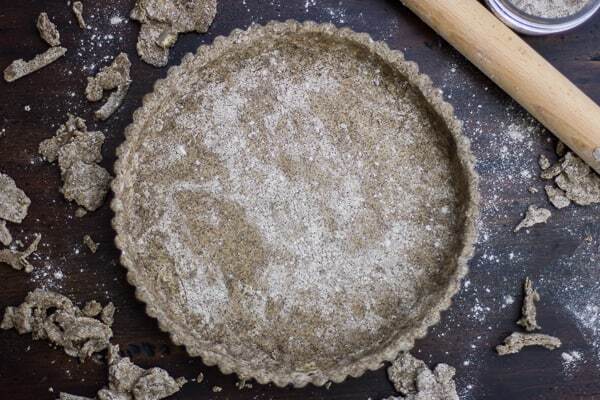 Cannot WAIT to attempt this tart….I love buckwheat (sarrasin here in France)…I was wondering if I could replace the xanthan gum with psyllium husks..or ground chia or flax? It seems as if I have read somewhere that these can be substitutes?..Thoughts from you or your readers? Aw, thanks, Donna! I haven't tried those binders in this recipe, but I've been seeing GF recipes that call for flax or chia, so it might be worth a try. Please let me know how it goes! Looks AMAZING. I made some membrillo that didn't set and this is its future! I missed this year's quince crop … again. Luckily I had some quince jam so I could make a baked apple and quince tart. While not as pretty as yours (I cheated with a bought puff pastry crust) it was pretty tasty. 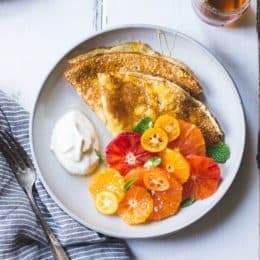 I just came across this recipe and it looks divine! But is there an easier way to make the crust? I won't be able to get my hands on white rice flour or xhantan gum. Thanks! Is gluten an issue for you? If not, you could use my regular pie dough recipe with buckwheat in place of the whole wheat/spelt flour. https://www.bojongourmet.com/2012/11/flakiest-all-butter-pie-dough.html Otherwise you could try a GF AP blend that is rice flour-based with xanthan gum in it. Let me know how it goes!